Customize and modernize your laundry premise to reflect your style and taste with new design accents from Huebsch®. Featuring clean lines, streamlined design and daring contrast, Cityspace’s refreshing urban touch to the control panel overlays deliver quality and add dimension to your premise with the ultra- modern chrome and stainless steel facet. 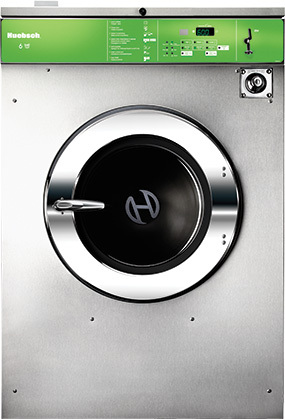 Our modern trim package with polished chrome door handles is now a standard on all Huebsch® cabinet washer extractors. Halo door rings and stainless steel tumbler fronts are available as on-trend upgrades – the perfect complements to our new control panel designs. These features are tested to the highest standards of quality and durability. Available on machines featuring Galaxy™ 600 controls, these design elements combine form and function with style and texture to enhance the customer experience and differentiate your laundry premise from your competitors’. The bold splash of colors coupled with the modern and sleek look of chrome and stainless steel of the Citron will help define your laundromat and add a dash of expressive creativity to the space. For those who prefer subtle tones for their coin laundry, Slate control panel overlays offer a traditional appeal. The chrome and stainless steel fixtures and body further personify the reliability and quality of this design.